The introduction of new products, stimulating discussions on developments in the industry, exchanges between experts – exhibitions are the ideal place for this. See where you can visit us at our exhibition booth here. The focus is on global trends in the forestry and timber industry at the LIGNA 2017 in Hannover – the world’s leading trade fair for wood processing machines, systems, tools and surface treatment technology. 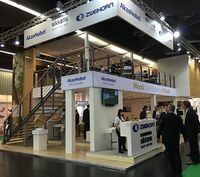 Once again, a great number of exhibitors from Germany and abroad will be presenting their latest items and innovative products at the show – including AkzoNobel, with the brands AkzoNobel Wood Adhesives, AkzoNobel Wood Coatings, Zweihorn® and Sikkens Wood Coatings. The LIGNA fair is being held from 22 to 26 May 2017 – this time with a brand-new layout concept. Save the date in your diary right away. We would be delighted to have the pleasure of greeting you at the trade fair in Hannover in Hall 26, Stand C23. Here you can call up our latest press releases. You can find older messages in our News archive.